Biomedicine claimsa significant stature in interdisciplinary application of scientific knowledge for healthcare benefits. The objective of Biomedicine research is to help in providing the solutions or better outcomes in relation to clinical practice from the appilications and insights drawn from the streams of science and technology. Considering the interdisciplinary nature of the topic and the necessity of the information exchange among the allied subjects biomedicine emerged as an amalgamation of basic scientific research and advanced applied sciences. Biomedicine holds the fields of microbiology, biochemistry, clinical, medical, computational and engineering aspects relevant to biomedical sciences. 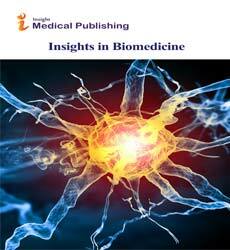 Biomedicine journal also encompasses the knowledge from cell biology, developmental biology, genetics, computational studies, biophysics, immunology, translational medicine biomedical research, biomedicine, biomedical science, biomedical engineering, biology, biomedical informatics, biomedical diagnostics, biomedical ethics, biomedical therapy, biomedical systems, biomedical technology, medical research, clinical research, physiology, pharmacology, biochemistry, personalized medicine, surgical instrument disciplines. Thus, there is an urge of a common podium for the fraternity dealing with any aspect of the subject. Therefor the wide scope of the journal will aid in contributing a great measure for the excellence in the scientific research. Insights in Biomedicine renders a communication platform for the researchers, academicians, students, medical practitioners, clinicians dealing with relevant subjects. Articles are considered as research article, review article, short communication, case reports, opinions, etc. Clinical Medicine is the study and practice of medicine in relation to the care of patients; the art of medicine as distinguished from laboratory science. The definition information for clinical medicine is provided by Stedman's. You can search our medical dictionary here. Biomedical technology is a broad term that combines engineering and technology to solve biological or medical problems involving humans, especially the design and use of medical equipment used to diagnose and treat various diseases. Biomedical technology can also be broken down into smaller sub-fields, including those outlined in the following paragraphs. Journal of Biomedical Science, Journal of Biomedical Research, Translational Biomedicine Journal, Aperito International Journal of Biomedicine, Asian Biomedicine Systems Biomedicine, Biomedical Journal, Biomedicine International Journal, Biomedicine Journal. Nanomedicine is the medical application of nanotechnology. Nanomedicine ranges from the medical applications of nanomaterials and biological devices, to nanoelectronic biosensors, and even possible future applications of molecular nanotechnology such as biological machines. Nature Nanotechnology,Nature Biotechnology, Nano Today, Nanotechnology, Science and Applications, Journal of Nanobiotechnology. Biophysics is an interdisciplinary science using methods of, and theories from, physics to study biological systems. Biophysics spans all scales of biological organization, from the molecular scale to whole organisms and ecosystems. Annual Review of Biophysics, Quarterly Reviews of Biophysics, Biochimica et Biophysica Acta - Gene Regulatory Mechanisms, Biomaterials, Biochimica et Biophysica Acta - Bioenergetics Biophysical Journal. Biomedical Engineering is the branch of biomedical technology concerned with the application of engineering design and principles to medical and biological issues is called biomedical engineering. Your work as a biomedical engineer would involve developing and growing synthetic organs or creating prosthetic limbs to replace diseased or injured parts of the human body. IEEE Transactions on Biomedical Engineering, Journal of Biological Engineering, Annals of Biomedical Engineering, International Journal for Numerical Methods in Biomedical Engineering, IEEE Reviews in Biomedical Engineering. Biomedical research is the study of various chemicals and substances used to develop and improve medicines that are used to treat disease. The research is often conducted using equipment and methods developed by people working in other branches of biomedical technology. Journal of Biomedical Research, International Journal of Biomedical Research, Biomedical Research, Journal of Biomedical Science BioMed Research, International Journal of Medicine and Biomedical Research (IJMBR). Immunology is the branch of biomedical science that deals with the response of an organism to antigenic challenge and its recognition of what is self and what is not. It deals with the defence mechanisms including all physical, chemical and biological properties of the organism that help it to combat its susceptibility to foreign organisms, material, etc. Nature Reviews Immunology, Trends in Immunology, Immunological Reviews, Journal of Allergy and Clinical Immunology, Advances in Immunology Mucosal Immunology, Open Biology. Biomedicine is a branch of medical science that applies biological and other natural-science principles to clinical practice. The branch especially applies to biology and physiology. Journal of Biomedical Science, International Journal of Biomedical Science, Journal of Biomedical Research, International Journal of Biomedical Research, Biomedical Research. Biochemistry is the branch of science concerned with the chemical and physico-chemical processes and substances which occur within living organisms. The International Journal of Biochemistry & Cell Biology, Archives of Biochemistry and Biophysics, Analytical Biochemistry, Journal of Biochemistry, Journal of Medical Biochemistry. Molecular and Genetic Medicine, Stem Cell Research & Therapy, Phylogenetics & Evolutionary Biology, Tissue Science & Engineering, Nanomedicine & Biotherapeutic Discovery, Genetic Syndromes & Gene Therapy. Cell biology is a branch of biology that studies cells – their physiological properties, their structure, the organelles they contain, interactions with their environment, their life cycle, division, death and cell function. Molecular and Genetic Medicine, Stem Cell Research & Therapy, Phylogenetics & Evolutionary Biology, Tissue Science & Engineering, Nanomedicine & Biotherapeutic Discovery, Genetic Syndromes & Gene Therapy, Biotechnology & Biomaterials. Toxicology is the study of the adverse effects of chemicals (including drugs) on living systems and the means to prevent or ameliorate such effects. In addition to therapeutic agents, toxicologists examine many environmental agents and chemical compounds that are synthesized by humans or that originate in nature. The toxic effects of these agents may range from disturbances in growth patterns, discomfort, disease or death of individual organisms or on whole ecosystems. There are many subspecialties of toxicology including: clinical toxicology, regulatory toxicology (both of these found in the pharmaceutical and toxicology industry), forensic toxicology, occupational toxicology, and risk assessment. Annual Review of Pharmacology and Toxicology, Trends in Pharmacological Sciences, Particle and Fibre Toxicology, Archives of Toxicology, Chemical Research in Toxicology, Toxicology and Applied Pharmacology.